The tagline for Google Hangouts on Air: “Broadcast live conversations to the world for free.” In combination with RSVPMaker, Hangouts on Air can also be a platform for webinars on a budget. (See this update on using YouTube Live instead). That’s certainly how I’m using the service: to hold online events to generate interest in a series of projects I’m working on without running up a big bill on a service like WebEx or GoToWebinar if I don’t need to. 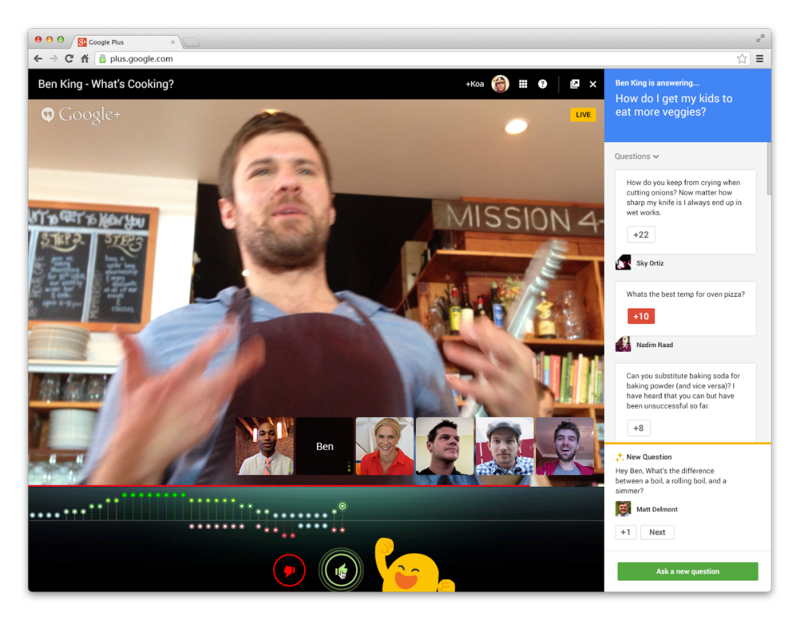 Hangouts on Air is a variation of Google Hangouts, the video chat service for small group discussions. The “on air” versions also supports multiple participants (co-hosts for your webinar or guests for your talk show) but also an “unlimited” number of viewers. The viewers do not participate in the voice or video chat (which would be unmanageable for a large audience), but those with a Google+ account can ask questions using the Q&A app as shown below. You can also do screen sharing and share info with a number of other Hangouts apps. I’ll be demonstrating on January 8 at 1 pm ET with a webinar on organizing webinars with RSVPMaker. 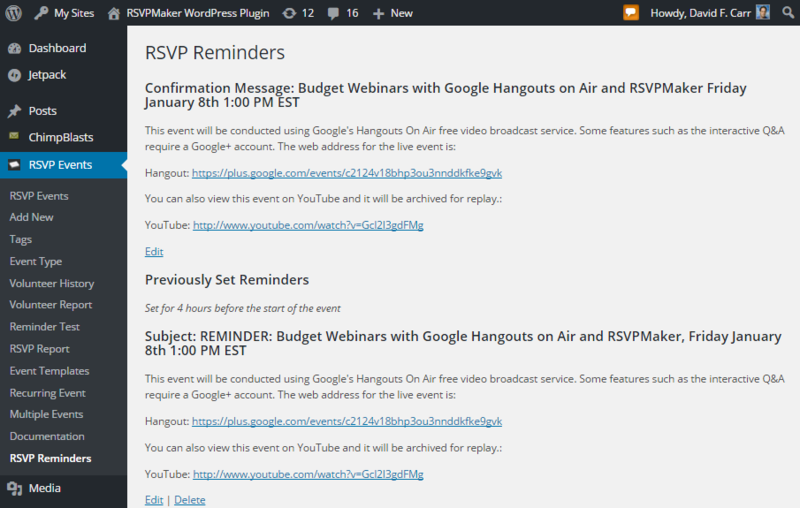 My original impetus to improve RSVPMaker Hangouts support was a WordPress for Toastmasters webinar series (January 5 and January 12). A Hangouts on Air session with Q&A enabled (the sidebar on the right). After checking out Pat Flynn’s How to Run a Q&A Session Using Google Hangouts on Air and a few similar articles and videos, I realized one of the main drawbacks people pointed to is that Hangouts on Air is not a “complete webinar platform.” What that means is it doesn’t provide some common marketing tools like signup forms and reminder / follow up emails (autoresponders). So now RSVPMaker fills that gap for anyone who runs a WordPress-powered website. 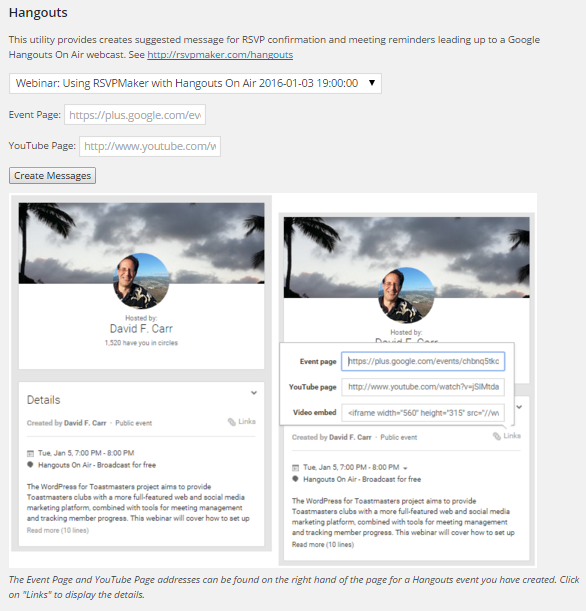 When you create a scheduled Hangouts on Air session, Google assigns unique web addresses for an associated Event Page and YouTube Page (the video stream of your hangout can also be viewed on YouTube and will automatically be archived there when the event is over). The new, improved RSVPMaker RSVP Reminders page lets you use that information to create confirmation and reminder messages to direct people to the online event. You can get them to register on your website, capturing some information about them in the process, then reveal the event page addresses in the follow up messages. The Scheduled Reminders page in RSVPMaker tells you what information to supply and where to find it when creating RSVP confirmation and reminder messages. Once you create the initial confirmation message, you can create scheduled messages that will go out to attendees either prior to or after the event. In addition to reminding people of the event page address, these messages can direct them to additional resources. When the event is over, you can point them to the replay and encourage them to download a white paper or ebook, buy a product, or sign up for a service that you are promoting. Create and edit confirmation messages and reminders on the RSVP Reminders screen. 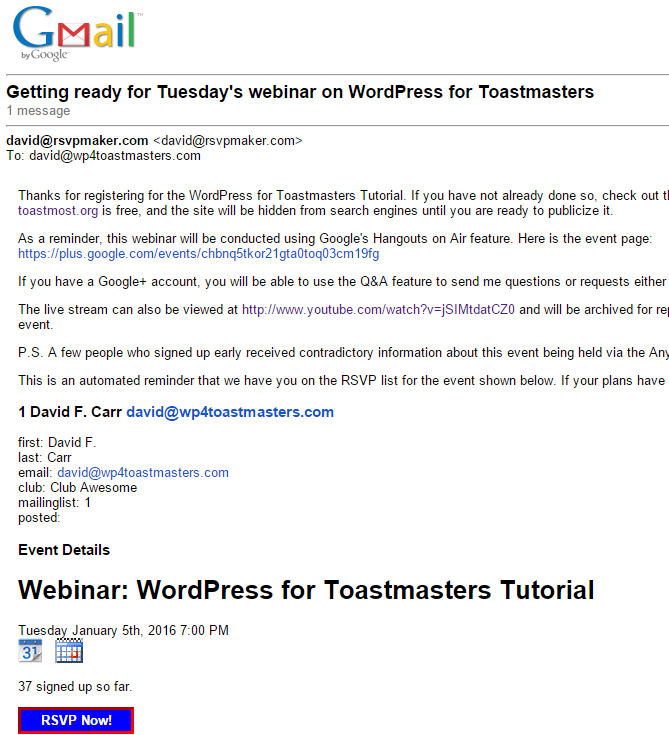 Here is a sample email reminder message for my WordPress for Toastmasters webinar. Reminders are sent out on the schedule you specify, with the Hangouts and YouTube links and a snapshot of the event description. Reminders sent out prior to the event will include a copy of the event listing from your website, allowing attendees to update their RSVP if necessary. You must make sure you have the timezone setting correct. WordPress defaults to UTC 0 (Greenwich Mean Time), so if you live anywhere outside of that timezone and have not changed the default setting, the timing of your reminders will be wrong by a matter of hours. To improve email deliverability, create an email account on your server specifically for the purpose of sending reminder messages, including the mail server parameters in the SMTP settings under Settings->RSVPMaker in the WordPress administrator’s dashboard. RSVPMaker uses the WordPress WP-Cron scheduling mechanism, which can be imprecise because it only runs when someone visits your website. See this article for tips on making the scheduling routine run more reliably on low-traffic websites. The basic advice is use a more reliable scheduler, such as a unix cron job, that triggers scheduled tasks on a regular basis (every hour at least; maybe every 5 or 15 minutes). This is also the newest part of RSVPMaker. There may be bugs. I encourage you to help me work through them. I welcome your suggestions on how to make it better. On the other hand, if you are wildly successful with this combination and find yourself making money off of it, consider making a donation to support me in this work.